Amazingly, no one was seriously hurt when a car slammed into a toll booth plaza near St. Cloud, Florida. Dramatic video captured the moment a car slammed into Central Florida toll plaza, sending one of its passengers flying across pay lanes before landing near a neighboring booth. Surveillance video obtained by NBC affiliate WESH-TV shows the white Cadillac SUV speeding toward the toll plaza near St. Cloud in Osceola County and crashing into a barrier between pay lanes. A passenger is ejected from the vehicle and lands between a nearby booth and a car that had stopped to pay the toll, footage shows. The vehicle's engine bursts into flames and another occupant can be seen staggering out of the smoke-filled SUV. According to the Florida Highway Patrol, three other passengers inside the vehicle were also able to escape the fiery crash. The driver and four passengers were taken to a local hospital, treated for minor injuries and released, WESH reported. A FHP trooper wrote in his report that the driver appeared to be fatigued at the time of the June 3 crash. It was not immediately clear why bystanders did not immediately rush to the vehicle to check on the occupants after the crash. 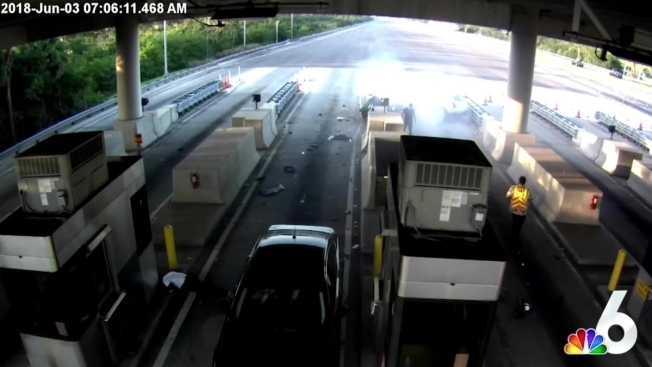 Video footage shows at least one toll booth worker walking away from the crash lane, seeing the ejected man lying motionless on the ground, but does not approach him. The employee is seen again moments later talking to someone who is not in the camera's view before the video ends.